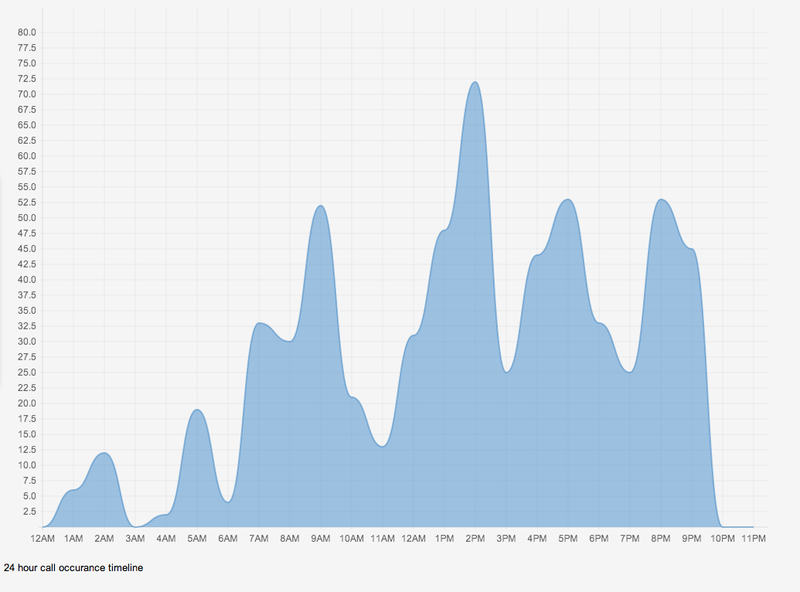 ScanEyes is a PHP web front end for visualizing, listening to, and archiving trunked radio traffic. It allows user registration, permissions, and playlist creation. A means to record police dispatch calls in my city, so I can recall them when my local news paper publishes their “police blotter” section. 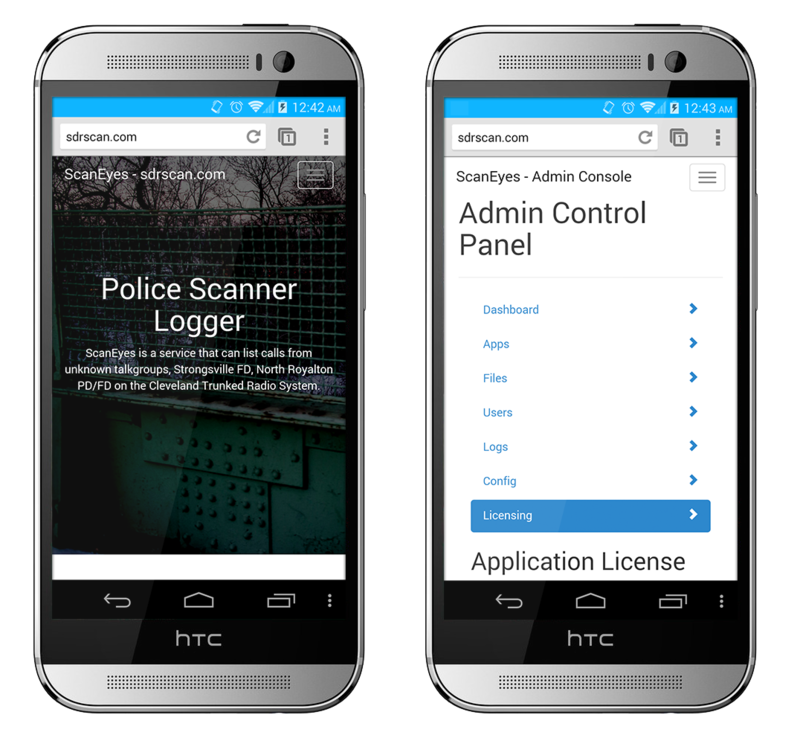 The ScanEyes application is run in Apache with PHP without the need for a SQL server. LogRecorder is a PHP script that runs in php-cli.exe (no web server) It polls sdrsharptrunking.log for file changes every 150ms and spawns an audio recorder if an active talkgroup is picked up by Unitrunker. EverythingSearch by Void Tools indexes these files and when a user queries ScanEyes, the query is sent to es.exe with the search term. The resulting data is manipulated into various tables and charts. Here is a diagram of the entire setup, including extra features I’ve built into the server for, for example, streaming live audio with low latency. This entire setup runs at about 7% total CPU utilization for a Core i5 4670K during idle. Main culprits for CPU usage are SDRSharp, 5%; and Unitrunker, 2%. There are two pieces of hardware in this setup, two SDR dongles. One talks to Unitrunker, another talks to SDRSharp. 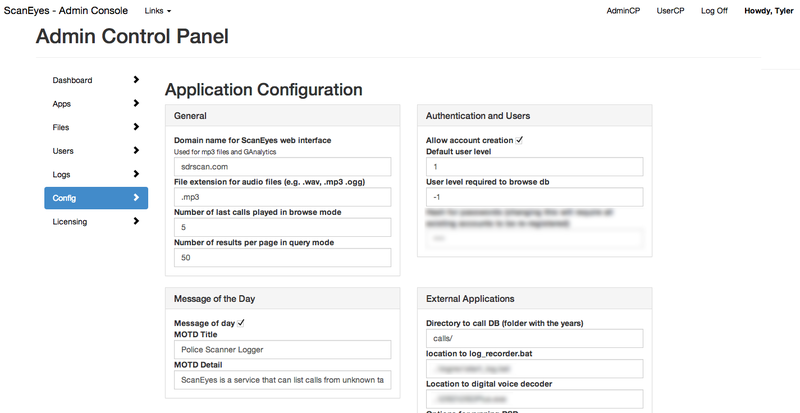 Unitrunker has plugins that allow remote tuning of the active control channel. By default, every talkgroup has the same priority, so it’s first come first serve. Unitrunker has 2 features, priority, and lockout. Lockout mutes the talkgroup so it is never listened to, and priority gives a talkgroup more priority over others. 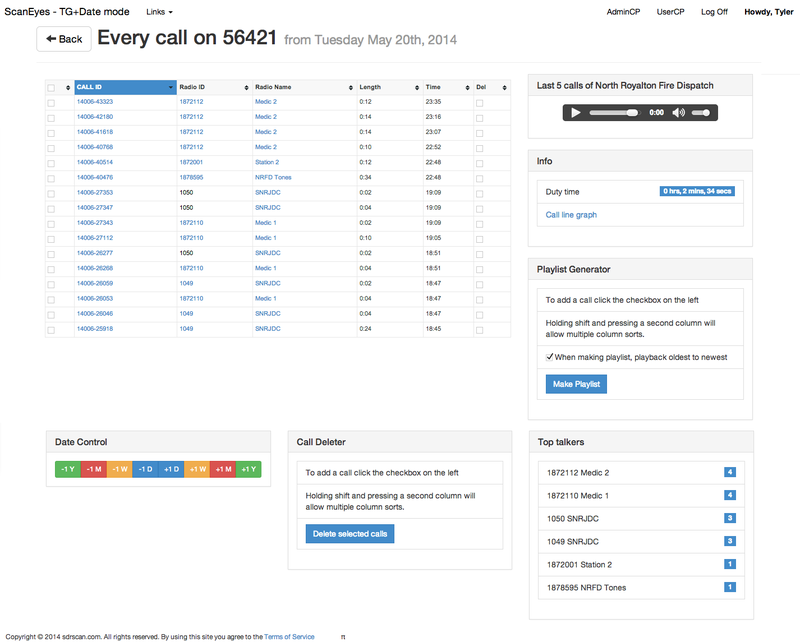 Useful for example, when you want to hear SWAT traffic over FD traffic. remote.dll is a plugin that writes the current listening talkgroup to a file. SDRSharp is a piece of software that acts as a virtual radio, you can tune it to what ever frequency you want, and it will communicate with the second SDR to receive radio signals. SDRSharp has a plugin that listens to remote.dll. This way, unitrunker can tell SDRSharp what channel to listen to, to get voice out. SDRSharp will then output this sound to a virtual audio cable. Virtual audio cables act as pipelines for audio from one program to another. In this case, we are taking the audio from SDRSharp, and putting it into our digital voice program. P25 is a radio communications protocol that usually carries voice traffic. If you were to listen to P25 straight from the speaker, you would not hear voice, but digital noises like this. These noises can be decoded into regular voice by a program called DSD. All DSD needs is an input and output audio device and you’ll get clean listenable audio. Listenable talkgroups along with all data is set through unitrunker, locking out a talkgroup causes LogRecorder to not record the call in the first place. User and talkgroup prototype feature in unitrunker allows a user to prioritize newly added talkgroups, or lock them out, if only known talkgroups want to be logged. Users can create playlists to share via email, reddit, G+, or Facebook. Limitations provided by Unitrunker, SDR#, and remote.dll only allow LogRecorder to record 1 call at a time. There can’t be simultaneous recording of more than 2 talkgroups at once. System requirements, a.k.a. everything needed to listen to and record trunked radio calls. I’ve decided not to open source my work until an experienced PHP developer can review my code from a security standpoint. I’ve taken all possible measures to deter hackers, focusing mainly on input sanitization. That said. If you find anything on sdrscan.com, I’ll pay you via paypal to report these vulnerabilities to me. Until then, I will allow other users(persons) to run this software provided that they don’t share it, or use my code elsewhere without my permission. Also, I doubt this will ever happen, but if a company would like this software, you can contact me directly. As it stands right now, this software uses licensing servers with key validation. This was my first large scale PHP project. I’ve learned a lot along the way, which has caused some code discrepancies. For example not having a database out of pure laziness to learn MySQL. As I learn new things, I will begin to incorporate or update those features.